Addis Ababa, April, 04 2019: Under the theme “Poverty Eradication Through Strategic Investments at National and Regional Levels Towards Social Development, Labour and Employment in Africa” the Minsterial meeting of the 3rd Ordinary Specialised Technical Committee (STC) on Social Development, Labour and Employment (STC-SDLE-3) officially opened today in the Headquarters of the African Union Commission. Speaking at the opening ceremony, H.E. Mrs. Amira El Fadil, Commissioner for Social Affairs highlighted the importantce of the meeting due to its tripartite nature which involves the government sector and its social partners, the trade unions and business sector. “This meeting has a unique opportunity not only to recognize the paradign shifts that are evident in population dynamics and demographic indicators but also to shape strategies to once and for all confront the debilitating poverty vicious circle that has unfortunately come to be synonymous with African development narrative.” Mrs. Amira El Fadil further added “Through Agenda 2063, Africa has called for inclusive growth and sustainable futue integrating and meeting the peculiar exigencies- a notion epitomized by the annual theme “The year of Refugees, Returnees & Internally Displaced Persons: Toward Durable Solutions to Forced Displacement in Africa”. Commissioner for Social Affairs called upon ministers to harness the socio-economic dividend through scaling up social security and social protection as that will have a direct transformative impact on population of Africa. “By extending social protection Africa will be able to prevent and overcome situations that adversely affect people’s well-being, particularly those who are in poverty stricken circumstances” underscored Mrs. Amira El Fadil . The Commissioner concluded by applauding the efforts of member states in pushing for substantial strategic investments to the course of social development, social security and social protection as well as labour and employment in order to create sustainable environment for inclusive growth. Underscoring the significance of provision of a stable income, H.E. Dr Ergogie Tesfaye, Minister of Labour and Social Affairs, Federal Democratic Republic of Ethiopia during the opening ceremony said that poverty is still remains a critical challenge for all of us. She noted that the progress in the fight against extreme poverty has been way slow. “Today more than half of the world’s 725 million people living in extreme poverty are in Africa. Poverty eradication is at the heart of AU Agenda 2063 and it’s First Ten Year Implementation Plan” added Dr Ergogie Tesfaye. She encouraged African ministers to engage with other ministers of finance, industry, investment, health to find solutions that work for all of us and inspire others. The outgoing Chairperson of the STC, Mr. Mohamed Khyat, out going Chair of the STC-SDLE 3 and Permanent Secretary of the Ministry of Labour, Employment and Social Security of the Republic of Algeria outlined activities that the bureau undertaken during its mandate related to issues on labor and migration and recommended modalities of work for the next bureau. The Incoming Chair of the STC-SDLE3 was announced, Honorable Minister of Public Service, Labour and Social Protection of Burkina Faso, Mr. Seni Mahamadou Ouedraogo. Representatives from different institutions indicated the importance of the theme of the STC and that it requires a collective effort to achieve the development of Africa. Ms. Cynthia Samuel Olonjuwon, ILO Assistant Director General and Regional Director for Africa said that the African Union remains the most important strategic partner of the ILO, which aligns its decent work priorities with the continental decent work priorities articulated in Agenda 2063 and the Declaration and Plan of action on Employment, poverty Eradication and Inclusive Development (Ouagadougou +10) adopted at the AU Extraordinary Summit of Heads of States and Governments in Ouagadougou in September 2014. She urged member states to pay attention to the rural and informal economies; invest in enhancing the cababilities of young women and men as well as to foster lifelong learning; promote productivity and harness the benefits of the digital economy, particularly for youth. The Secretary General of BUSINESSAfrica, Ms. Jacqueline Mugo, called upon the African Union to coordinate a common African position and be able to present a united front that advances Africa’s interests when dealing with labour, social protection, productivity and employment issues. 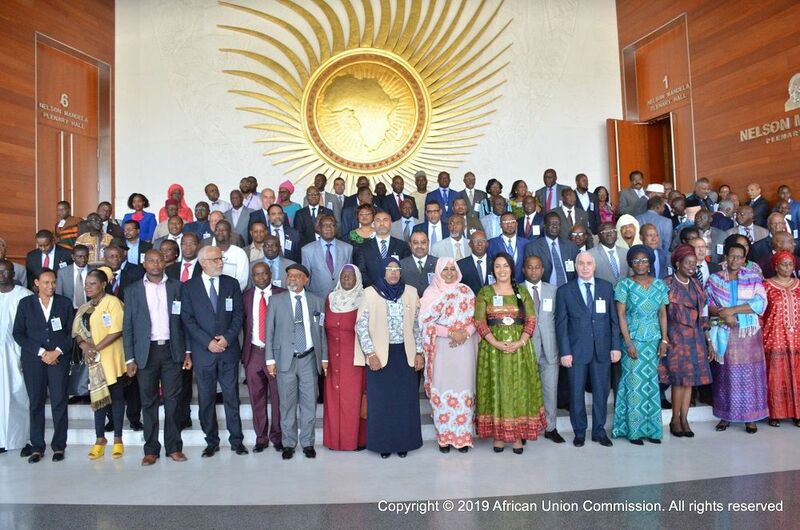 AU Member States urged to prioritize strengthening of social dialogue and supporting tripartism at all levels from industries, sectoral, national, regional and continental levels. The Secretary General of the Organisation of African Trade Union Unity (OATUU), Mr. MEZHOUD Arezki noted that the theme for this session is at the core of OATUU concerns as a collective partner representing the labor force and a key player in the equation of development and advancement in Africa. The STC ministerial session will continue between 4-5 April 2019 and will consider the report of the meeting of experts of STC-SDLE-3.